On 19 August GeoNet reported that activity at Tongariro's Te Maari Craters had declined significantly since the eruption in 2012, with data suggesting that unrest associated with the eruption was over. The Volcanic Alert Level was lowered to 0 (on a scale of 0-5). The Volcanic Alert Level for Ngauruhoe is separate and had been lowered to 0 on 20 April. A previous report on Tongariro covered the 6-7 August 2012 eruption and subsequent return to quiet (BGVN 37:07). Aside from a short-lived eruptive episode on 21 November 2012, GeoNet Data Centre reported only occasional mild degassing and small earthquakes occurred through August 2013. No further eruptive activity was reported through late 2014. Activity during 2012. Degassing continued after the August 2012 eruption. Gas flux was relatively low on 29 August; sulfur dioxide emissions were 150 tonnes/day and carbon dioxide flux was 420 tonnes/day. Gas flights on 13 and 18 September revealed sulfur dioxide levels of 980 and 540 tonnes/day, respectively, and carbon dioxide flux of 1,340 tonnes/day on 18 September. The report noted that although the levels were lower than the 2,100 tonnes/day of sulfur dioxide and 3,900 tons of carbon dioxide measured on 9 August, shortly after the eruption, they had increased and were considered significant. A field team visited the craters on 13 September and noted that Upper Te Maari crater has been widened and deepened by the 6 August eruption. They installed a new webcam pointed directly at the new Te Maari vents. GeoNet researchers visited the Upper Te Maari Craters on 30 September to sample fumaroles, conduct a carbon dioxide soil gas survey, collect ejecta from the August eruption, and photograph the area (figures 9 and 10). The average carbon dioxide soil gas flux was lower than on 27 July; 24 sites had increased fluxes while 20 had decreased. The estimated soil gas emissions had decreased overall from about 5.8 to 2.5 metric tonnes per day. Figure 9. View of Te Maari craters at Tongariro looking S on 30 September 2012. Courtesy of GeoNet. Figure 10. View of Upper Te Maari Crater looking E, 30 September 2012. Courtesy of GeoNet. On 12 October, GeoNet reported that gas plumes drifting downwind had been detected a hundred kilometers or more away. During the previous two weeks an odor attributed to venting was noticed in Manawatu (112 km S) and Hawke's Bay (120 km ESE). On 30 October the SO2 flux was 154 tonnes per day and the carbon dioxide flux was 477 tonnes per day. Several teams of scientists visited the Te Maari Craters on 5 November to service portable seismometers (complementing four permanent installations), sample gas vents, and collect samples of ejecta. The GeoNet report noted that not many earthquakes had been recorded recently, and that the hottest gas vent was 235° C while the others ranged from 95-104°. A small eruption at the Te Maari Craters occurred at 1325 on 21 November (figure 11), without precursory events, prompting GeoNet to raise the Volcanic Alert Level to 2 and the Aviation Colour Code to Red. A report at 1730 noted that the eruption appeared to be over; the Aviation Colour Code was lowered to Orange, signaling that ash was no longer being emitted. Figure 11. An ash plume rose from the Te Maari Crater at Tongariro at 1330 local time, shortly after the 21 November 2012 eruption. Courtesy of Institute of Geological and Nuclear Sciences, Ltd. The eruption occurred from the same area as the eruption on 6 August and lasted less than five minutes, although local seismic activity lasted about 15 minutes. GNS staff and hikers saw the eruption; an ash plume rose 3-4 km above the Upper Te Maari crater and produced ashfall across part of State Highway 46 and NE towards Turangi (21 km NE). Two small pyroclastic density currents were produced at the base of the column, to the W and N of the crater, and traveled a few hundred meters downslope. Later that afternoon gas-and-steam plumes drifted SE. On 22 November a sulfur gas odor was reported downwind in Manawatu (S) and Hawke's Bay (115 km ESE). A substantial amount of gas was emitted during 22-23 November. The Aviation Colour Code was lowered to Yellow on 23 November due to the absence of emitted ash. On 26 November GeoNet noted that no further volcanic activity had occurred since the eruption, gas flux had decreased, and seismic activity remained low. Reports during 2013 and 2014. GeoNet reported on 14 February 2013 that no eruptive activity had been detected since the 21 November 2012 explosion. Steam-and-gas plumes rose from the Te Maari Craters, and had been unusually strong during recent weeks possibly due to weather conditions. On 25 March GeoNet reported continued quiescence, but with continuing steam-and-gas plumes. The Aviation Color Code was lowered to Green (second lowest on a 4 four-color scale) and the Volcanic Alert Level remained at 1 (on a scale of 0-5). On 6 August 2013 small earthquakes were detected beneath Tongariro. These events were recorded only by a few seismic stations and were too small to be precisely located. GNS Science noted that the earthquakes could simply have been part of the background unrest typical of most active volcanoes, but they were of interest because there had been so few since November 2012 and potentially could have signaled changes inside the volcano. The amounts of CO2 and sulfur gases emitted from Tongariro had remained at low levels since the start of 2013 and were about half the amount produced after the November 2012 explosion. These conditions, and the small number and small size of recent earthquakes, were not sufficient to alter the unrest status of the volcano; the Volcanic Alert remained at Level 1; the Aviation Color Code remained Green. On 23 December 2013 GeoNet reported that the volcano continued to remain quiet. A few small earthquakes were recorded on the northern flanks at a rate of 2-3 per month. Gas measurements showed SO2 fluxes of about 10-15 tonnes/day, also a low level. Volcanologists also sampled the fumaroles on Te Maari that have been active since the 2012 eruptions; the main fumarole, which often provides strong steam plumes visible from Taupo, was emitting gases at over 400 °C. A 10 February 2014 survey of carbon dioxide (CO2) emissions near Red Crater (~4 km SSW from Te Maari) noted little change since a 2009 survey. In 2009 there was a calculated flux of 47 tonnes per day from the survey area. The result from the February 2014 survey indicated a flux of 39 tonnes per day; the difference was not considered significant. The temperature just below the ground surface was also similar to 2009 values. Information Contacts: GeoNet, a collaboration between the Earthquake Commission and GNS Science (URL: http://www.geonet.org.nz/); GNS Science, Wairakei Research Center, Private Bag 2000, Taupo 3352, New Zealand (URL: http://www.gns.cri.nz/). On 20 April GeoNet reported that it had been three weeks since anomalous seismicity at Tongariro's Ngauruhoe cone had been detected. In addition, no anomalous ground temperatures or unusual levels of gas emissions were detected at the summit during fieldwork, indicating that the minor unrest had ceased. The Volcanic Alert Level was lowered to 0 (on a scale of 0-5). A small eruption at Tongariro's Te Maari Craters occurred at 1325 on 21 November, without precursory events, prompting GeoNet to raise the Volcanic Alert Level to 2 and the Aviation Colour Code to Red. A report at 1730 noted that the eruption appeared to be over; the Aviation Colour Code was lowered to Orange. The eruption occurred in the same area as the previous eruption on 6 August and lasted less than five minutes, although local seismic activity lasted about 15 minutes. GNS staff and hikers saw the eruption. An ash plume rose 3-4 km above the Upper Te Maari crater and produced ashfall across part of State Highway 46 and NE towards Turangi (21 km NE). Two small pyroclastic density currents were produced at the base of the column, to the W and N of the crater, and traveled a limited distance of a few hundred meters downslope. Later that afternoon gas-and-steam plumes drifted SE. On 22 November a sulfur gas odor was reported in Manawatu (S) and Hawke's Bay (115 km ESE), downwind of Tongariro. A substantial amount of gas was emitted during 22-23 November. The Aviation Colour Code was lowered to Yellow on 23 November due to the absence of emitted ash. On 26 November GeoNet noted that no further volcanic activity had occurred since the eruption, gas flux had decreased, and seismic activity remained low. GeoNet reported that seismic activity at Tongariro remained low during 14-16 August; weather conditions prevented observations of the craters. There were several reports of gas odors on 15 August, particularly from the Manawatu region (S). On 17 August GeoNet noted that although very minor amounts of ash were emitted in the first few days after the eruption, there had been no significant activity since 6 August. Seismic activity had returned to low levels after the eruption. The Alert Level was lowered to 1 (on a scale of 0-5) and the Aviation Colour Code remained at Yellow (second lowest on a four-color scale). GeoNet reported that favorable weather allowed GNS Science and Department of Conservation scientists to conduct an observation flight over Tongariro on 8 August. They noted actively steaming vents that were visible at a new crater area formed on 6 August below the Upper Te Mari crater, but low clouds prevented any views above this elevation. Blocks of old and hydrothermally altered lava, as large as 1 m in diameter, ejected by the eruption fell 1.5-2 km from the Te Mari craters area. Falling blocks formed impact craters in the ground in an extensive area to the E and W of the new vents. Most blocks were covered by grey ash but many on the W slopes were not, suggesting that they were ejected after the main ash-producing phase of the eruption. The scientists also noted that previously steaming ground at Ketetahi and Lower Te Mari crater appeared more vigorous, but there were no obvious major changes. A debris flow generated by the eruption partly filled a stream valley draining N-W from the Upper Te Mari crater area. The deposit had blocked some stream tributaries but most water diverted around the edges. Ash had slumped from the banks into the stream valley, and in other stream valleys ash has been re-mobilized in slurry flows. No lahars were generated by the eruption. New rock falls were visible around the walls of the new vent area and Lower Te Mari craters and in some stream valley walls near the craters. This suggested that significant ground shaking took place during the eruption. The Alert Level remained at 2 (on a scale of 0-5) and the Aviation Colour Code was lowered to Yellow (second lowest on a four-color scale). During 8-9 August seismic activity remained at a low level; only a few small events were recorded. Preliminary analysis of the ash showed that there was little to no new magma erupted. Gas analysis on 9 August revealed emissions around 2,100 tonnes per day of sulfur dioxide, 3,900 tonnes per day of carbon dioxide, and 364 tonnes per day of hydrogen sulfide, confirming the presence of magma below the volcano. During an overflight on 9 August scientists observed minor ash emissions from the vents. Seismicity continued to remain low during 10-14 August. Heavy rains on 12 August caused a lahar to cross State Highway 46, approximately 6 km W of Rangipo. On 7 August white steam clouds rose from the Te Mari craters area but poor weather conditions at the time obscured a direct view of the active vent(s). A few small earthquakes had been detected. A news article stated that alpine guides observed three active vents that appeared to be new. On 31 July GeoNet reported that seismicity at Tongariro had declined the previous week but increased again during 28-29 July, and as of 31 July, between 3 and 10 events were being recorded daily. The earthquakes were clustered in a zone between Tongariro and the E side of Lake Rotoaira, at 2-7 km depth. The Alert Level remained at 1 (on a scale of 0-5) and the Aviation Colour Code remained at Yellow (on a four-color scale). A sequence of small volcanic earthquakes beneath Tongariro was detected by a few of the seismometers in the permanent network. Earthquakes with magnitudes less than 2.5 were clustered between Emerald Crater (E of the summit) and the Te Mari craters (2 km E east of Ketetahi hot springs on the N flank) at 2-7 km depth. The sequence started on 13 July, soon declined, and then again increased during 18-20 July. The Alert Level was raised to 1 (on a scale of 0-5) and the Aviation Colour Code was raised to Yellow (on a four-color scale) on 20 July. In response to the increased seismicity, GeoNet installed four portable seismographs and conducted gas and spring sampling. During 21-22 July seismicity declined; one event was detected on 23 July. Provisional analysis of the gas samples collected during 21-22 July indicated a marked increase in the volcanic gas component of the typical mix of volcanic and hydrothermal gases. Residents reported a gas odor. Seismic activity from Tongariro continued to remain elevated during 27 July-1 November. Temperature and gas-concentration measurements from the summit remained normal. The Volcanic Alert Level remained at Level 1 (some signs of unrest). According to GeoNet on 14 June, seismic activity at Ngauruhoe (the youngest cone of the Tongariro complex) remained elevated. The Alert Level remained at 1. According to GeoNet, the number of small low-frequency earthquakes at Ngauruhoe (the youngest cone of the Tongariro complex) increased in the past 3 weeks. On 6 June, the Alert Level was raised to 1. "Ngauruhoe volcano went into eruption on 22 January 1974. In the evening it was erupting red-hot blocks to a height of several hundred feet and at times down the outer flanks. Aerial inspections on 23 and 24 January, while the eruption of steam and ash continued with varied but moderate intensity, showed no lava to be visible in the crater within at least 100 m of the rim. During this stage of the eruption, blue flames of burning sulphur were seen at a fumarole about 200 m down the N flank. "Ash eruption continued, interspersed by occasional violent explosions which reached maximum intensity on 26 and 27 January, when a number of explosive eruptions momentarily enveloped the entire summit in ash and sent large blocks cascading down the sides. A number of hot avalanches were observed. By 28 January the frequency of the eruptions was decreasing. "The activity is continuing but on a reduced scale. The volcano has been intermittently active on a minor scale over the past year but not very impressively. The present activity is more in the nature of a major eruption." Information Contacts: J. Healy, New Zealand Geological Survey. "The aircraft made several passes over the eastern side of Ngauruhoe from 1000 to 1015. There was a vigorous light grey ash column rising to approximately 4,000 m, and drifting WNW. Fine ash was falling from the ash cloud and there was a thin covering of recently deposited ash over the whole of the western side of Tongariro. Red Crater had lost its characteristic color and was a uniform light grey. Banks of cumulus cloud had built up on the NW of the mountain probably due to the presence of ash within the cloud. Elsewhere there was no cloud. Haze existed over the area between Ngauruhoe and Lake Taupo, probably also due to dust particles from the eruption. There appeared to be two vents within Ngauruhoe crater. Ash was being erupted from a northerly vent and white steam from a southerly vent. It was not possible to look into the crater to estimate the depth of the lava column. The volcano was in a Vulcanian phase of eruption with widespread distribution of fine ash. No blocks were observed to be ejected during the duration of the observations." Information Contacts: J.W. Cole, Victoria University of Wellington, New Zealand. 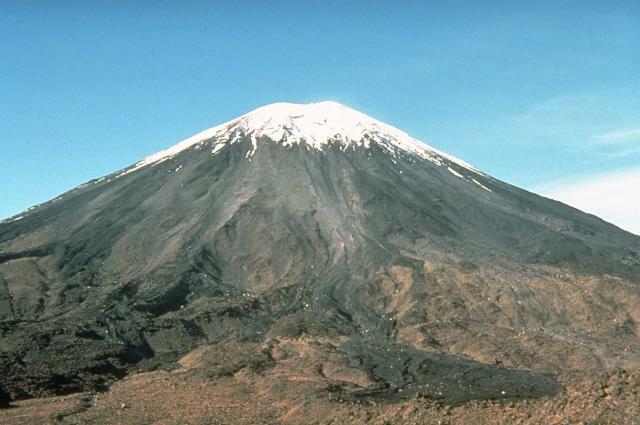 Ngauruhoe volcano erupted ash intermittently between 12 and 19 February in the first major activity since March 1974. Bad weather restricted observations, but several explosive ash eruptions occurred. An aerial inspection on the morning of 19 February revealed no obvious change in crater topography, and no new large ejecta on the summit. No ash emission was occurring. At about 1300 on 19 February (NZ Daylight Time) Ngauruhoe suddenly commenced the most voluminous pyroclastic eruption since the 1954 lava flows. A coherent, strongly convoluting eruption column rose to 11,000 m above sea level (8,700 m above the summit), spreading out into an ash cloud reaching 14,600 m above sea level. Continual ash emission was accompanied by a series of visible air shock waves, loud explosions, and large pyroclastic avalanches down the slopes of the 600-m-high cone. Incandescent ejecta was clearly visible in the eruption column. Walking parties within 2 km of the crater were pelted with scoria, and one group was nearly over-run by hot avalanches which passed close to the walking tracks. This eruption was accompanied by vigorous volcanic tremor and lasted until about 1420 on 19 February, when ash emission ceased. Ash was blown 160 km to the NNW to fall on Hamilton City. A series of violently explosive eruptions followed periods of quiescence later in the afternoon. Explosions were accompanied by large visible air shock waves, closely followed by ejection of very large blocks (many up to 20 m above the crater. Extremely loud and very sharp reports were heard close to the volcano, loud rumblings being heard at least 70 km distant. Very dense eruption slugs expanded violently above the crater to envelop the summit and collapse into large pyroclastic avalanches which flowed rapidly down the cone. Impacting blocks raised large dust clouds down the cone, and set fire to tussock grass on surrounding areas. Smaller blocks (up to 1 m across) were thrown 2 km to the N, forming 2-m-diameter craters near walking tracks on Mt. Tongariro. Sharp volcanic earthquakes accompanied each explosion, which were preceded by periods of low seismic activity. Incandescent ejecta was observed during the night of 19-20 February as activity waned. Bad weather restricted observations on 20-21 February, but steam explosions and small mud flows were observed. A helicopter landing on the summit was made on 22 February. The summit was covered by large blocks of lava which had been plastic on impact, the largest measuring 27 m long. Part of the western crater wall had collapsed into the vent. The crater was no deeper than after March 1974, due to infilling by collapse of vent walls, and possibly upward movement of a lava plug. No liquid lava was apparent in the vent. Strong gas emission (including SO2) prevented clear observations and measurements within the crater, which appeared to be between 50 and 100 m deep. A further explosive eruption was reported on 23 February. Information Contacts: B.W. Marshall, University of Auckland, New Zealand. 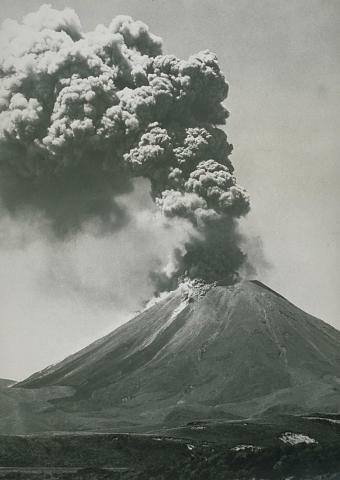 The NZGS reports that cigar-shaped eruption columns rose to 900 m above the crater on 4 July 1977 at 0800 and 1030. Information Contacts: New Zealand Geological Survey. On 10 May, NZGS personnel measured temperatures of the hot gases issuing from the crater bottom. Rockfalls from the overhanging E crater wall and growing talus fans had reduced the degassing area. Temperatures of 320-350°C were measured 1-2 m from the accessible edge of the hot area. These reflected a nearly steady decrease: 620° (1 July 1978), 520° (24 February 1979), 478° (25 June 1981), 418° (21 January 1982), 458° (10 June 1982), [349° (4 May 1983) and 105° (7 February 1985]. Ngauruhoe last erupted 12-23 February 1975, when strong explosive activity sent eruption plumes to 10 km and pyroclastic flows moved down the flanks (Nairn and Self, 1978). Reference. Nairn, I.A., and Self, S., 1978, Explosive eruptions and pyroclastic avalanches from Ngauruhoe in February 1975: JVGR, v. 3, p. 39-60. Further Reference. Balsillie, F.H., and Latter, J.H., 1985, Volcano-seismic activity at Ngauruhoe during 1983: New Zealand Volcanological Record, no. 13, p. 66-71. Information Contacts: W. Giggenbach, DSIR, Wellington. Fumarole temperatures (93.9 & 94.3°C) and preliminary gas chromatograph data collected on 7 April were unchanged since the previous fieldwork in March 1989. No significant deformation was evident. Seismicity has remained relatively low. Information Contacts: P. Otway, DSIR Geology & Geophysics, Wairakei. The following ... is based on fieldwork in late March and early May 1993. "Activity in the crater of Ngauruhoe has declined further over the past year and is at an all time low since records were first kept. Fumarole temperatures have decreased to 90°C after remaining stable at 94°C (boiling point for altitude) since 1986. No volcanic deformation was identified by surveys to points on the crater rim and at the base of the mountain." Information Contacts: B. Christenson, I. Nairn, P. Otway, and B. Scott, IGNS, Wairakei. Annual fieldwork was carried out on 30 March and 29 April 1994. Maximum fumarole temperatures had fallen to 78°C by the end of April. ... There was insufficient fumarole discharge for adequate sampling, and temperatures and pressures were at the lowest levels ever recorded. Except for minor landslide debris, no significant changes were noted in the Ngauruhoe crater. Tilt leveling surveys were carried out at the Tama Lakes (1.7 km SSW) and Mangatepopo (1.8 km NNW) locations on 30 March. Apparent tilt recorded at Tama Lakes during the previous 11 months represented 4 µrad of inflation, but was within the range of random fluctuations recorded since installation in 1978. 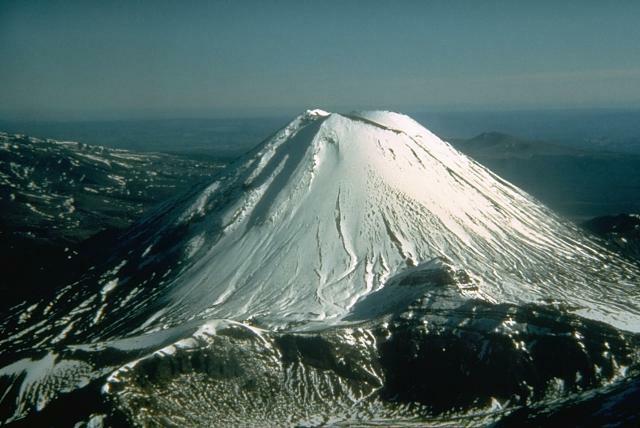 At Mangatepopo approximately 14 µrad of tilt towards Ngauruhoe (deflation) was recorded over the same period. This is ~2-3x the past noise level resulting from normal survey errors and seasonal movements. The most likely explanation, based on earlier experiences, is that two benchmarks near a walking trail have settled. Repairs were made to the three highest crater rim stations on 30 March and two new stations were installed; two old stations are scheduled for removal after the 1995 survey. All six rim sites were surveyed for horizontal deformation on 29 April. Measurements were made by EDM and theodolite from 2 km N on Tongariro volcano. Relative movement vectors for the 1992-94 period at three stations were well within the normal noise range. Instabilities noted at the other sites resulted from various surface movements. Overall, there was no indication of recent volcanic deformation. Geological mapping of the crater, N flank, and SW flank accomplished during these visits is part of the ongoing mapping project of the Tongariro complex. Extremely low activity levels were found during an annual crater inspection and deformation survey on 11 May in the crater and at the base of Ngauruhoe. Crater fumaroles failed to discharge gases: the first complete absence of activity ever previously reported there. However, the NE rim of the outer crater was steaming vigorously as in the past. Neither horizontal nor vertical deformation were of sufficient magnitude to suggest volcanic significance. The current level of crater activity is probably the lowest in recorded history. Ngauruhoe is the highest and most recent of more than a dozen composite cones that comprise the large Tongariro volcanic massif N of Ruapehu. Ten years ago, in February 1975, Ngauruhoe produced its last eruption, an event that generated 10-km-high plumes and pyroclastic flows. In 1983 several seismic swarms were recorded. Information Contacts: P.M. Otway, Institute of Geological and Nuclear Sciences (IGNS), Private Bag 2000, Wairakei, New Zealand. Ngauruhoe is the youngest and highest volcanic cone (figure 1) of the Tongariro volcanic complex on the North Island of New Zealand. According to New Zealand GeoNet Project volcanologists, the number of small (less than magnitude 2), low-frequency earthquakes near Ngauruhoe recorded by seismometers increased from less than five per day at the beginning of May 2006 to more than 20/day by the end of May. 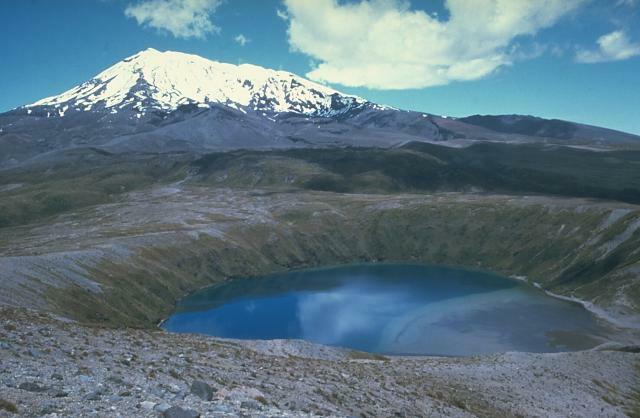 Typically, only a few earthquakes of any type are recorded in the vicinity of Ngauruhoe each year. In 1983, 1991, and 1994 there were clusters of similar earthquakes recorded near Ngauruhoe, but there have been very few recorded since then. Due to the increased seismicity, the Scientific Alert Level was raised to Alert Level 1 (some signs of unrest) on 6 June. Earthquakes of this type are commonly interpreted as being related to the movement of magma and/or volcanic gases. Figure 1. Snow covered Mt. Ngauruhoe as seen on 28 July 2006. Photo credit to University of Auckland Snowsports Club. Earthquakes peaked in early June at about 50/day and then declined to about 10-20/day by the 14th, with the largest about magnitude 1. Seismic activity has remained elevated through the middle of December 2006. Initial observations suggested that hypocenters were 1-4 km deep, slightly N or E of the summit. By mid-June volcanologists had installed three additional seismographs around the base of Ngauruhoe, including one that could be monitored in real-time. Between 14 June and 3 July the number of volcanic earthquakes recorded near Ngauruhoe has varied between approximately 20 and 40 per day. Using data from the additional seismographs, volcanologists were able to refine the location of the earthquakes to within about 1 km of the surface beneath the N flank; the largest events were approximately magnitude 1. Elevated seismicity continued at up to 30 events/day through October 2006. As of the last GeoNet report on 1 November, no other signs of unrest had been recorded. Multiple measurements showed that temperatures and volcanic gas concentrations have not changed since the increased seismicity began in May, and were similar to measurements made in 2003. Carbon-dioxide release through the soil (from degassing magma) is also similar to measurements in 2003. The maximum fumarole temperature near the summit is about 85°C. Reports of steaming in the summit area were investigated, but because no new features were seen that could have caused emissions, the sightings were attributed to clouds rather than volcanic activity. Information Contacts: New Zealand GeoNet Project, a project sponsored by the New Zealand Government through these agencies: Earthquake Commission (E.C. ), Geological and Nuclear Sciences (GNS), and Foundation for Research, Science and Technology (FAST) (URL: https://www.geonet.org.nz/); University of Auckland Snowsports Club, University of Auckland, New Zealand (URL: http://www.uasc.co.nz/). Our most recent report on Tongariro (BGVN31:12) discussed elevated seismicity during May-October 2006. The M < 2 long-period seismic event occurred near Ngauruhoe, the youngest cone of the Tongariro volcanic complex. Between 1 November 2006 and January 2008, elevated, low-level volcanic earthquakes continued at Ngauruhoe. The number of events per day typically ranged between 5 and 30. Then, on 6 January 2008, the number of events per day began to increase, and by 9-10 January the number had shot up to 80 per day, before decreasing slightly. The larger events ranged between M 1.2 and 1.5. In response to these changes, volcanologists from GeoNet visited on 17 January 2008 and measured gas concentrations, temperatures, and soil gas flux at the summit area of Ngauruhoe. The resulting data were similar to measurements made in 2006-2007. The maximum fumarole temperature near the summit remained about 86°C. No other signs of unrest were found. The data suggested that the earthquakes were occurring within about 1 km of the surface beneath the N flank. GeoNet noted that the number of volcanic earthquakes since mid-2008 has declined to background levels. Regular measurements of volcanic gas levels and the temperature of the summit gas vent have showed no changes over the previous two and a half years. Consequently, on 2 December 2008, the Alert Level was lowered from 1 to 0 (typical background activity). No thermal anomalies have been measured by MODIS/MODVOLC satellites (HIGP Hot Spots System) in the at least the past 5 years. Information Contacts: New Zealand GeoNet Project, a collaboration between the Earthquake Commission and GNS Science, Wairakei Research Centre, Private Bag 2000, Taupo 3352, New Zealand (URL: http://www.geonet.org.nz/); Hawai'i Institute of Geophysics and Planetology (HIGP) Hot Spots System, University of Hawai'i, 2525 Correa Road, Honolulu, HI 96822, USA (URL: http://modis.higp.hawaii.edu/). Elevated seismicity in July 2012 preceded a phreatic eruption at Tongariro on 6 August. The eruption ejected blocks of old lava from the crater area, and triggered a debris flow down a drainage on a flank of the volcano. Six days later, heavy rainfall remobilized some of the debris flow and generated a small flood/lahar that crossed a state highway. This report summarizes GeoNet alert bulletins and Taupo Civil Defense postings concerning the phreatic explosion and associated events (through 17 August 2012). Precursory seismicity. GeoNet reported elevated numbers of volcanic earthquakes (M < 2.5) beginning on 13 July (figure 2). Seismicity then declined until 18 July, when volcanic earthquakes returned, increasing in magnitude and abundance through 20 July. The earthquakes were clustered between Emerald Lake and the SE shore of Lake Rotoaira at 2-7 km depth; a subset of the earthquakes were tightly clustered between Blue Lake and Te Maari (Te Mari) Craters within the same depth range (figures 2 and 3). As a result, the Volcano Alert Level was raised from 0 to 1 (on a scale from 0-5) and the Avation Colour Code was raised from Green to Yellow (on a four color scale; Green-Yellow-Orange-Red) on 20 July. Figure 2. Seismicity at Tongariro during 11 July-6 August 2012, leading up to a phreatic eruption at 2350 on 6 August. Shown are the number of seismic events per day (107 in total, top panel), the depth at which each event occurred (and associated error bars, middle panel), and the magnitude of each event (bottom panel). Courtesy of GeoNet. Figure 3. Mapped epicenters of seismic events recorded at Tongariro during 25 May-23 August 2012. A phreatic eruption occurred late on 6 August (see figure 2). During the precursory activity (late July and early August), seismicity concentrated between Emerald Lake (E) and Lake Rotoaira (R), with a cluster between Blue Lake (B) and Te Maari Craters (T). Courtesy of GeoNet. By 23 July, GeoNet had deployed four portable seismometers and had sampled springs and fumaroles. They reported that provisional analyses of gas samples indicated a marked increase in volcanic gases above typical mixtures of hydrothermal and volcanic gas signatures (see subsection "Ash and gas analyses" for detail). By 31 July, GeoNet had also installed a GPS instrument to monitor any deformation. Phreatic eruption. At 2352 on 6 August, a phreatic eruption occurred from a vent located within the Te Maari Craters area. An explosion generated seismic signals that lasted a few minutes, followed by a series of discrete small earthquakes during the next few tens of minutes. Within 35 minutes, GeoNet posted an Alert Bulletin announcing that ashfall had been reported; the Volcano Alert Level was raised to 2 and the Aviation Colour Code was raised to Red. Taupo Civil Defense responded by closing State Highways 1 and 46 (to the E and N of Tongariro, respectively). Approximately one hour after the eruption, the Cooperative Institute for Meteorological Satellite Studies (CIMSS) observed in satellite imagery that an ash plume was drifting more than 50 km E from Tongariro (figure 4). They also reported that airports had cancelled flights at Gisborne (210 km ENE), Rotorua (120 km NNE), Taupo (60 km NE), and Palmerston North (135 km S). Figure 4. A Visible Infrared Imaging Radiometer Suite (VIIRS) image acquired by the Suomi National Polar-orbiting Partnership (NPP) satellite at 1252 UTC on 6 August 2012 (0052 NZST on 7 August) showing an ash plume drifting more than 50 km E from Tongariro, after the phreatic explosion ~1 hour earlier. The windward end of the plume remains over the volcano, implying ongoing emissions. In the main image, the North Island of New Zealand is outlined in teal, and Rotorua is labeled to the N of the plume. In both images, the ash plume is labeled in yellow, and Tongariro is labeled in red, just W of the plume. Courtesy of CIMSS. GeoNet reported that no volcanic tremor occurred before or after the event, and the Aviation Colour Code was reduced to Orange ~12 hours later (about 1200 on 7 August), and reduced again the next day (1500 on 8 August). GeoNet conducted an observation flight on 8 August and photographed a variety of features discussed and illustrated in more detail below. They included: (1) a new vent area residing in a small crater, and associated steaming fissures, (2) a debris flow, and (3) impact craters. The new vent(s) are located in the Upper Te Maari Craters area (figure 5a); low clouds prevented scientists from viewing areas higher than the lowest parts of Upper Te Maari Crater. Photographs of the area revealed a nearby steaming eruptive fissure, and more intense steaming in areas of ground that had been steaming prior to the eruption (figure 5b). Figure 5. Photographs taken after Tongariro's 6 August 2012 phreatic eruption showing the Upper Te Maari vent area. In (A) the view is looking SE towards Upper Te Maari crater, with areas of fumaroles and a new vent on the outer edge of the crater (indicated by the arrow). (B) is looking NW showing vents along a fissure around the S side of Upper Te Maari crater. Upper Te Maari crater is indicated in each photo with the '*' symbol. Both photographs were taken during a morning observation flight on 8 August 2012. Courtesy of GeoNet. A debris flow generated by the phreatic eruption comprised rock and soil debris that blocked a stream valley draining NW from the Te Maari Craters area (figure 6). GeoNet reported water ponding around the edges, and ash that had been remobilized into slurry flows. GeoNet noted that areas of the debris flow (especially in the upper sections) had eroded into the substrate (figure 6a). Figure 6. Upper (A) and lower (B) portions of the debris flow generated by the 6 August 2012 phreatic eruption at Tongariro. The debris flow extended down a stream valley draining NW from the Te Maari Craters (steaming areas visible in the top-most portion of (A)). White asterisks in both photos indicate regions where the debris flow eroded into the substrate. White arrows in (B) indicate areas of newly ponded water at the edges of the flow. Courtesy of GeoNet. The explosion ejected blocks of lava up to 2 km from the Te Maari Craters area, leaving impact craters in vegetation and ground surfaces (figure 7). All blocks were angular, and none were steaming or surrounded by burnt vegetation; GeoNet thus concluded that the blocks comprised old (non-juvenile) lava(s) ejected from the vent area. Figure 7. Blocks of lava ejected up to 2 km from the Te Maari Craters area during the phreatic explosion on 6 August 2012 left impact craters in vegetation and ground surfaces (circled). Courtesy of GeoNet. Ash and gas analyses. Textural analyses indicated that the ash emitted during the 6 August explosion contained little-to-no fresh (juvenile) lava, suggesting that the eruption was primarily steam driven (phreatic). GeoNet also reported that analysis of the fluorine content of the ash indicated that, except in the immediate vicinity of the volcano, there were little health or agricultural concerns. For 9 August, GeoNet reported emissions of 2,100 tons/day of SO2, 3,900 tons/day of CO2, and 364 tons/day of H2S from vents. Sulfur (H2S) smells were reported in downwind locations during 11-12 August, and further reports were filed from the Manawatu region on 15 August. GeoNet attributed the sulfur odors to "passive degassing of magma beneath the surface of Tongariro." Heavy rains spawn minor lahar. 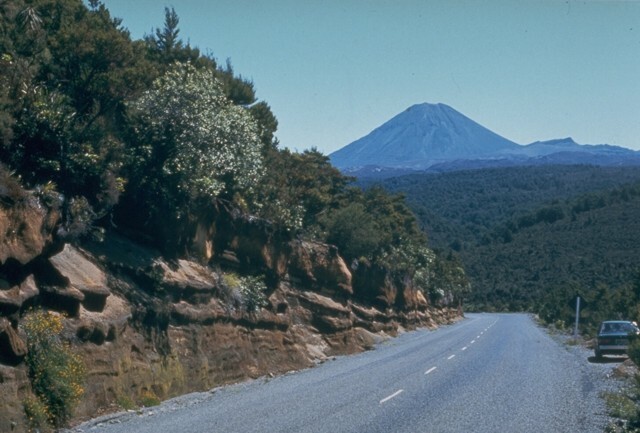 In concert with the 11 August release of a new, updated hazard map of Tongariro (figure 8), GeoNet warned motorists not to stop their vehicles along Highway 46 (N of Tongariro) due to hazards in that area. Following heavy rains the next morning, a minor flood/lahar crossed State Highway 46 near the S tip of Lake Rotoaira (at a location ~6 km W of Rangipo). According to the New Zealand Herald, a driver described 13-cm-deep mud crossing the road at 0830 that day. Scientists at GNS Science stressed that the lahar was not a direct result of an eruptive process, and a resident reported that the area was commonly washed out during heavy rains. Figure 8. The updated hazard map released by GeoNet on 11 August 2012, which includes the 6 August vents seen in Tongariro's Te Maari Craters area (dashed black circle). As seen in the legend, the map indicates the locations prone to pyroclastic flows and mudflows (shaded yellow) and an area within a 3 km radius of the summit that is prone to gas hazards and flying rocks (shaded orange). Where the two zones overlap, the map is shaded red. Red dots indicate eruptive vents active in the last 27,000 years. Orange triangular "hut" icons indicate nearby mountain refuges. The larger poster conveys extensive hazard information. Note disclaimer (upper left) and wide range of agency collaboration (lower right) in map production. The highest peak of the complex is at Ngauruhoe (near the SW corner of the map). As stated in the comment in the SW corner of the map, "Tongariro and Ngauruhoe are parts of one active volcanic system." Courtesy of GeoNet. Ten days after the phreatic explosion, GeoNet reduced the Volcano Alert Level to 1, stating that minor eruptive activity, required for Volcanic Alert Level 2, had ceased. The Aviation Colour Code remained at Yellow as of 24 August 2012. Information Contacts: GeoNet, a collaboration between theEarthquake Commission and GNS Science (URL: http://www.geonet.org.nz/); GNS Science, Wairakei Research Center, Private Bag 2000, Taupo 3352, New Zealand (URL: http://www.gns.cri.nz/); Earthquake Commission (EQC), PO Box 790, Wellington, New Zealand (URL: http://www.eqc.govt.nz/); The Cooperative Institute for Meteorological Satellite Studes (CIMSS), a collaboration between theUniversity of Wisonsin-Madison, theNational Oceanic and Atmospheric Administration, and theNational Aeronautics and Space Administration, Space Science and Engineering Center, 1225 W. Dayton St., Madison, WI 53706 (URL: http://cimss.ssec.wisc.edu/); University of Wisconsin-Madison (UW-Madison) (URL: http://www.wisc.edu/); National Oceanic and Atmospheric Administration (NOAA) (URL: http://www.noaa.gov/about-noaa.html); National Aeronautics and Space Administration (NASA) (URL: http://www.nasa.gov/); New Zealand Herald (URL: http://www.nzherald.co.nz/). Tongariro is a large andesitic volcanic massif, located immediately NE of Ruapehu volcano, that is composed of more than a dozen composite cones constructed over a period of 275,000 years. Vents along a NE-trending zone extending from Saddle Cone (below Ruapehu volcano) to Te Mari crater (including vents at the present-day location of Ngauruhoe) were active during several hundred years around 10,000 years ago, producing the largest known eruptions at the Tongariro complex during the Holocene. North Crater stratovolcano, one of the largest features of the massif, is truncated by a broad, shallow crater filled by a solidified lava lake that is cut on the NW side by a small explosion crater. The youngest cone of the complex, Ngauruhoe, has grown to become the highest peak of the massif since its birth about 2500 years ago. The symmetrical, steep-sided Ngauruhoe, along with its neighbor Ruapehu to the south, have been New Zealand's most active volcanoes during historical time. This volcano is located within the Tongariro National Park, a UNESCO World Heritage property. Cole J W, Graham I J, Hackett W R, Houghton B F, 1986. Volcanology and petrology of the Quaternary composite volcanoes of the Tongariro volcanic centre, Taupo volcanic zone. Roy Soc New Zeal Bull, 23: 224-250. Cole J W, Hochstein M P, Skinner D N B, Briggs R M, 1986. Tectonic setting of North Island Cenozoic volcanism (Tour Guide C1). New Zeal Geol Surv Rec, 11: 5-60. Hackett W R, Houghton B F, 1986. Active composite volcanoes of Taupo volcanic zone (Tour Guide C4). New Zeal Geol Surv Rec, 11: 61-114. Hobden B J, Houghton B F, Lanphere M A, Nairn I A, 1996. Growth of the Tongariro volcanic complex: new evidence from K-Ar age determinations. New Zeal J Geol Geophys, 39: 151-154. Hobden B J, Houghton B F, Nairn I A, 2002. Growth of a young, frequently active composite cone: Ngauruhoe volcano, New Zealand. Bull Volcanol, 64: 392-409. Lecointre J A, Neall V E, Cleland Wallace R, Prebble W M, 2002. The 55- to 60-ka Te Whaiau Formation: a catastrophic, avalanche-induced, cohesive debris-flow deposit from Proto-Tongariro volcano, New Zealand. Bull Volcanol, 63: 509-525. Lube G, Cronin S J, Platz T, Freundt A, Proctor J N, Henderson C, Sheridan M F, 2007. Flow and deposition of pyroclastic granular flows: a type example from the 1975 Ngauruhoe eruption, New Zealand. J. Volcanol. Geotherm. Res., 161: 165-186. Nairn I A, Kobayashi T, Nakagawa M, 1998. The ~10 ka multiple vent pyroclastic eruption sequence at Tongariro volcanic centre: Taupo volcanic zone, New Zealand: Part 1. Eruptive processes during regional extension. J. Volcanol. Geotherm. Res., 86: 19-44. Shane P, Doyle L R, Nairn I A, 2008. Hetergeneous andesite-dacite ejecta in 26-16.6 ka pyroclastic deposits of Tongariro volcano, New Zealand: the product of multiple magma-mixing events. Bull Volcanol, 70: 517-536. Topping W W, 1973. Tephrostratigraphy and chronology of late Quaternary eruptives from the Tongariro volcanic centre, New Zealand. New Zeal J Geol Geophys, 16: 397-423. There is data available for 79 Holocene eruptive periods. There is no Deformation History data available for Tongariro. 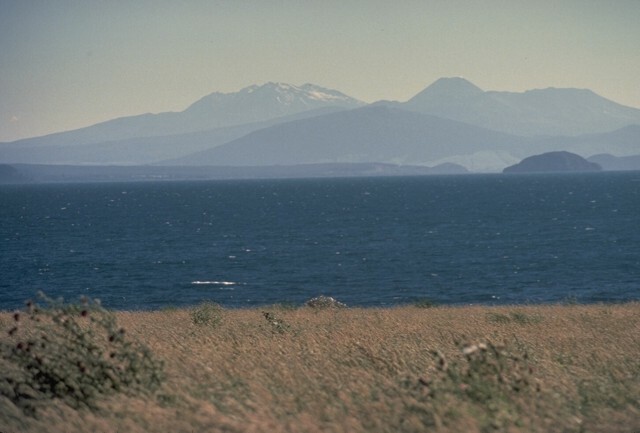 This telephoto view looking SW across Lake Taupo, the southernmost major caldera of the Taupo volcanic zone, shows several major peaks anchoring the southern end of the Taupo volcanic zone. The broad forested peak below the center horizon is the Pleistocene Pihanga volcano. The steep-sided cone on the horizon to its right is Nguaruhoe, the youngest volcano of the Tongarior complex. The broad massif to its right is Tongariro. The snow-capped massif on the left-center horizon is Ruapehu. Photo by Tom Simkin, 1986 (Smithsonian Institution). 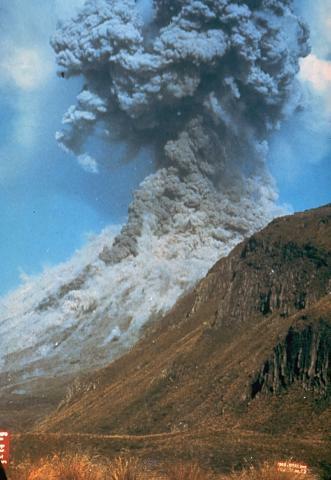 Pyroclastic flows sweep down the flanks of Ngauruhoe volcano on February 19, 1975, as a powerful, ash-laden eruption column rises above the summit crater. This eruption was one of the largest of Ngauruhoe in historical time. The eruption column rose 12 km above the vent, ash fell 160 km away on Hamilton City, and pyroclastic flows reached the base of the cone. Explosive activity had begun on the 12th and continued until the 23rd. Photo by Graham Hancocks, 1975 (New Zealand Geological Survey). A vulcanian explosion from Ngauruhoe volcano in New Zealand on February 19, 1975, ejects a dark, ash-laden cloud. Large, meter-scale ejected blocks trailing streamers of ash can be seen in the eruption column. Blocks up to 20 m across were projected hundreds of meters above the vent. Photo by Ian Nairn, 1975 (New Zealand Geological Survey). 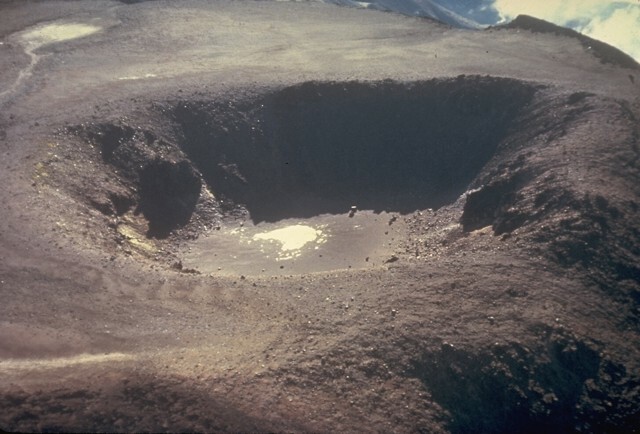 An aerial view from the south in the late 1970s shows a close-up of an explosion crater that cuts a flat-lying former lava lake on the summit of the North Crater cone of the Tongariro volcanic complex. The explosion pit which makes up the bulk of the slide is 400 m diameter. Photo by Ian Nairn, late 1970s (New Zealand Geological Survey). Two large andesitic volcanic massifs anchor the southern end of the Taupo volcanic zone. Tongariro, in the foreground, is a cluster of about a dozen composite cones dominated by the symmetrical Ngauruhoe stratovolcano. Ruapehu, in the background to the south, contains a frequently active crater lake. The two volcanoes have been the most active in New Zealand during historical time. Photo by New Zealand Geological Survey, 1981. The SE wall of Red Crater is cut by a vertical volcanic dike that fed eruptions along a NE-SW-trending fissure. Magma at the outer part of the dike cooled against the red scoria walls of Red Crater, while magma at the center of the dike partially drained away, leaving this cavity. Ngauruhoe stratovolcano towers in the background; it and Red Crater are two of the more than a dozen composite cones forming the Tongariro volcanic complex. The black lava flows extending from the summit of Ngauruhoe volcano to its flanks were erupted in 1954. An eruption that began with explosive activity on May 13, 1954, was followed on June 4 by the emission of lava flows that traveled down the NW flank until September 26. Explosive activity, which constructed a cinder cone in the summit crater, continued until March 1955, and incandescent lava was present in the crater until June. 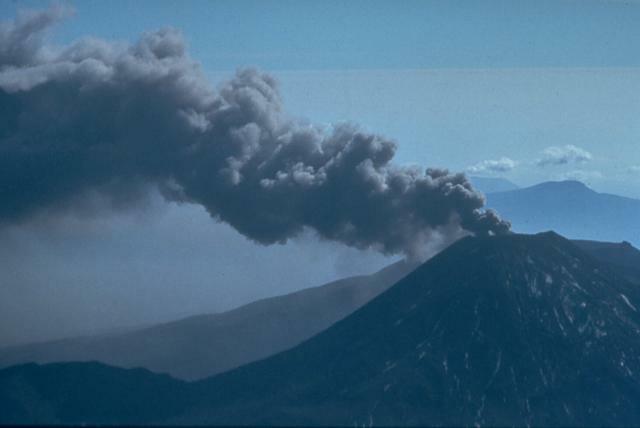 An ash plume on March 29, 1974, is deflected by the wind from the summit of Ngauruhoe volcano one day after powerful explosions that were accompanied by pyroclastic flows. Intermittent explosive eruptions had been occurring since November 22, 1972, and continued until August 19, 1974. 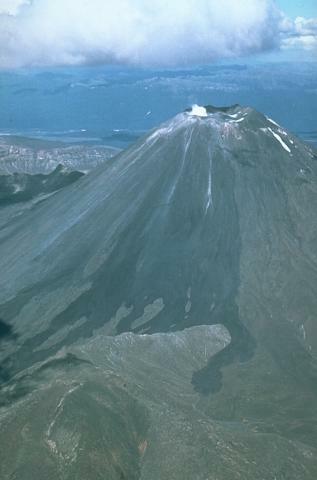 Eruptions in January and March 1974 were the largest in two decades from Ngauruhoe. Photo by Jim Cole, 1974 (University of Canterbury). A roadcut along the desert road between Waiouru and Turangi exposes some of the tephra layers erupted from the Tongariro volcanic complex during its early stage of development. Conical Ngauruhoe volcano, which formed during the past 2500 years, rises in the background. Lower Tama Lake, on the NE flank of Ruapehu volcano (upper left), was formed late in a series of eruptions that began about 10,000 years ago from vents ranging from the summit craters of Ruapehu to Te Mari craters of the Tongariro volcanic center. The Tama Lake eruptions included the emplacement of two lava flows from upper Tama Lake with a combined volume of 0.2 cu km and a smaller lava flow from lower Tama Lake. An ash-rich eruption column ascends above Ngauruhoe volcano on January 26, 1974 in this view from the west. Small pyroclastic flows descend the upper flanks of the cone. 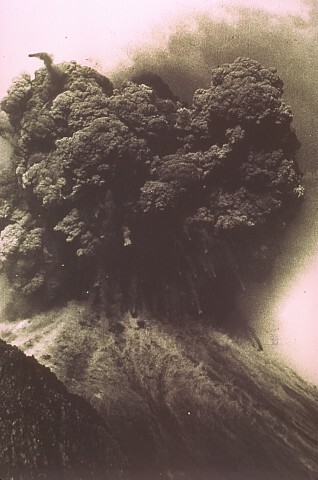 Eruptions January 26-28 and March 27-29, 1974, were the most powerful at Ngauruhoe in two decades. Explosive activity had been occurring since November 1972, and lasted until August 1974. The dark streaks descending to the base of the cone at the left are lava flows from the 1954 eruption. Photo by D.L. Homer, 1974 (New Zealand Geological Survey). 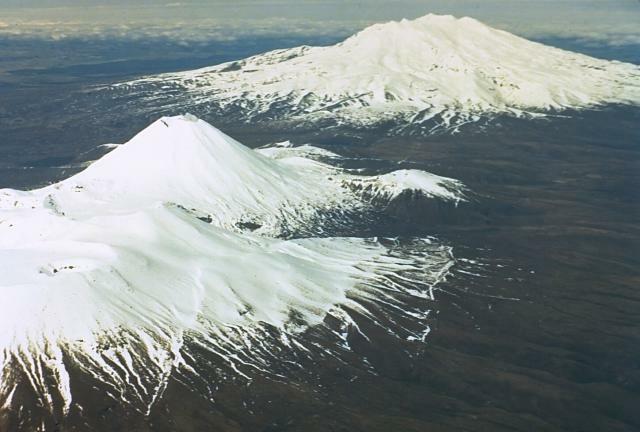 Snow-capped Ngauruhoe is a small 2291-m-high stratovolcano that was constructed during the past 2500 years. The symmetrical volcano, seen here from the NE, rises 800 m above its surroundings and is the highest peak of the Tongariro volcanic center. Tongariro is a large andesitic volcanic massif, located immediately NE of Ruapehu volcano, that is comprised of more than a dozen composite cones. Frequent explosive eruptions have been recorded from Ngauruhoe since its first historical activity in 1839. Snow-capped Ngauruhoe volcano rises above the Mangatepopo track on the NW side of the volcano. 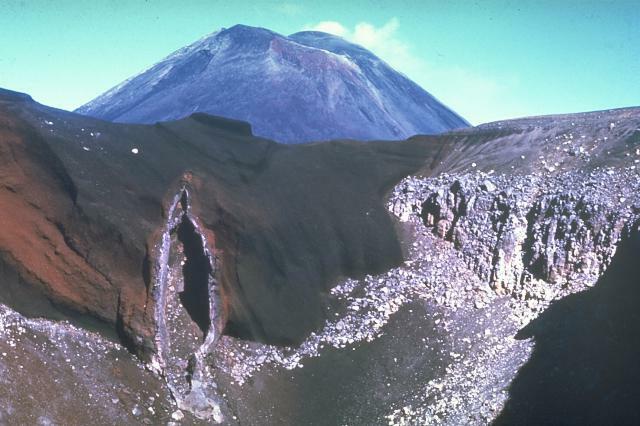 The dark lobe in the right foreground is a deposit produced by lithic-rich pyroclastic flows during the 1975 eruption. Meter-scale ballastic clasts from powerful vulcanian explosions during the 1975 eruption were ejected to distances of 2.8 km, beyond the location of this photo. Large Eruptions of Tongariro Information about large Quaternary eruptions (VEI >= 4) is cataloged in the Large Magnitude Explosive Volcanic Eruptions (LaMEVE) database of the Volcano Global Risk Identification and Analysis Project (VOGRIPA).